Spain: Day 339 of 985 of the Spanish Civil War. Spain: Day 704 of 985 of the Spanish Civil War. CBI - China: Day 349 of 2,987 of the 2nd Sino-Japanese War. Day 10 of 139 of the Battle of Wuhan. CBI - China: Day 714 of 2,987 of the 2nd Sino-Japanese War. Day 7 of 68 of the Battle of Tianjin. CBI - Mongolia: Day 41 of 129 of the Battle of Khalkhin Gol, a border dispute between the Soviet Union and Japan. ETO - Netherlands: Just five weeks after the German conquest of the Netherlands, Dutch civilians are being conscripted as forced laborers. During the war, 431,500 Dutch civilians will meet this fate. More than 30,000 will perish through hunger, sickness and maltreatment. 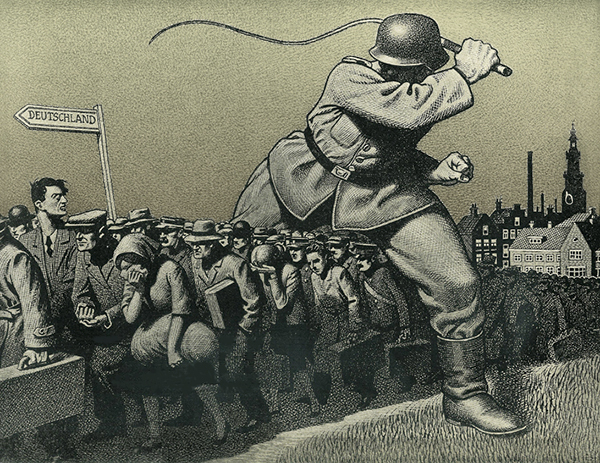 On 28 Feb 41, the German Reichskommissar in Holland proclaimed an ordinance concerning the "duty for the performance of services," providing for the forced employment of Dutch citizens in Nazi Germany and its occupied territories. The recruitment took place initially through regional Dutch employment offices who possessed the means for enforcement, specifically in the case of unemployed persons. Some Dutch participated in active resistance during the war. Unique to the Dutch resistance movement, the activities in which they engaged were overwhelmingly non-violent, though some attacks did take place. Much of the resistance efforts centered around the forging of ration cards, counterfeiting money, and hiding Jews, forced labor candidates and downed Allied airmen. The use of forced labor in Nazi Germany and throughout German-occupied Europe during WWII took place on an unprecedented scale. The Nazis abducted approximately 12 million people from almost twenty European countries; about two thirds of whom came from Eastern Europe. At its peak the forced laborers comprised 20% of the German work force. Even before the war, Nazi Germany maintained a supply of slave labor. This practice started from the early days of labor camps filled with "undesirables" such as homeless, homosexuals, criminals, political dissidents, communists, Jews and anyone whom the regime simply wanted out of the way. Prisoners in Nazi labor camps were worked to death on short rations and in bad conditions, or killed if they became unable to work. Many died as a direct result of forced labor under the Nazis. By 1944, the number of civilians pressed into brutal forced labor in the Netherlands reached over 5% of the population. For many years after the war the plight of Dutch former forced laborers was not recognized by the public at large, nor by the Dutch government. 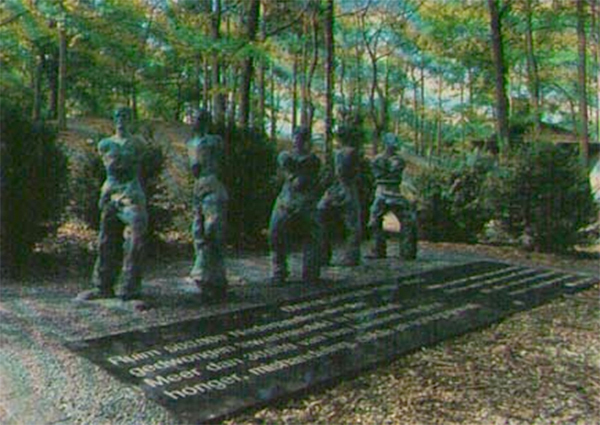 Official recognition finally came on May 29, 1996, with the unveiling of this monument. UK: Both Houses of Parliament meet in a secret session to discuss Home Defense. Atlantic: German submarines U-30, U-38, U-48 and U-122 each sink a merchant vessel in the waters surrounding the United Kingdom and in the Bay of Biscay. Atlantic: The German heavy cruiser GNEISENAU is damaged by a torpedo from the British submarine HMS CLYDE 80 miles northwest of Trondheim, Norway. ETO - France: The RAF bombs the German controlled airfield at Rouen. ETO - France: Day 42 of 44 of the Battle of France. German troops capture Lyons. 9,000 Polish soldiers fighting in France are evacuated to the UK. Down south, Italian troops begin an offensive along the French Riviera coast. French envoys drive behind German lines to receive the armistice terms. East Africa: Day 11 of 537 of Italy's East African campaign in the lands south of Egypt. CBI - Indochina: The French government in northern Indochina opens its ports to Japanese military and supporting troops. CBI - China: Day 1,080 of 2,987 of the 2nd Sino-Japanese War. Day 219 of 381 of the Battle of South Guangxi. USA: In a message to Congress, President Roosevelt denounces the sinking of the American merchant ship ROBIN MOOR by U-69 as an act of piracy. USA: The United States Army Air Corps (USAAC) is renamed as the United States Army Air Force (USAAF) under the command of Major-General Henry H "Hap" Arnold. Atlantic: German sub U-123 sinks the Portuguese ship GANDA off Casablanca, French Morocco. Eastern Front: German troops amassing on the border with the Soviet Union are told that they are undergoing a large scale exercise. MTO - Libya: Day 72 of 256 of the Siege of Tobruk. Middle East: Day 13 of 37 of the Battle for Syria and Lebanon. Indian and Free French troops attempt to relieve the surrounded Indian 5th Infantry Brigade at Mezze, French Mandate of Syria and Lebanon, but are repelled. After sundown, Free French, British and Australian troops capture Qadim. East Africa: Day 376 of 537 of Italy's East African campaign in the lands south of Egypt. CBI - China: Day 1,445 of 2,987 of the 2nd Sino-Japanese War. USA: Winston Churchill arrives at Franklin Roosevelt's home at Hyde Park, New York, to discuss US-UK cooperation. The two leaders agree to give the crossing of the English Channel top priority and that the two nations will assist each other in atomic weapons research. USA: The New York Times publishes a report from the World Jewish Congress saying that the Germans have, to date, killed 1,000,000 Jews in a "vast slaughterhouse for the Jews" located in Eastern Europe. Atlantic: Day 158 of 169 of Germany's Second "Happy Time," during which U-boats sink 609 Allied ships with little risk. Germany: About 1,000 Austrian Jews arrive at Theresienstadt Concentration Camp. They are the first Austrian Jews to arrive at this camp. Meanwhile, four Polish prisoners at Auschwitz break into a SS store room, steal uniforms and weapons and then escape in SS disguise. Russian Front - North: Day 286 of 872 of the Siege of Leningrad. Russian Front - North: Day 47 of 658 of the Siege of the Kholm Pocket. Russian Front - Center: Day 23 of 31 of Operation KREMLIN, a German diversion to trick the Soviets into thinking Moscow is their main objective instead of Stalingrad and the Caucasus. Russian Front - South: Day 234 of 248 of the Siege of Sevastopol, Crimean Peninsula. The Soviet north line starts to collapse as the Germans capture Fort Lenin. MTO - Libya: Day 26 of 27 of the Battle of Gazala. Rommel makes what will be the final attack on Tobruk. East Africa: Day 47 of 186 of the Battle of Madagascar. CBI - China: Day 1,810 of 2,987 of the 2nd Sino-Japanese War. Day 37 of 124 of Japan's Zhejiang-Jiangxi Campaign, launched to punish anyone suspected of aiding the Doolittle raiders in China. Roughly 250,000 Chinese will be killed. PTO - Alaska: Day 14 of 435 of the Battle of Kiska, Aleutian Islands. US 11th Air Force B-24s bomb targets on Kiska Island. PTO - Canada: Japanese submarine I-26 bombards Estevan Point, Vancouver Island, British Columbia. PTO - Malaya: Day 122 of 357 of the Battle of Timor Island. PTO - New Guinea: US 5th Air Force bombs the runway at Lae. USA: A fist fight between two men, one white and one black, at Belle Isle Park in Detroit, Michigan, turns into a major riot that lasts for days and comes to be known as the Battle of Belle Isle. When order is finally restored, 34 people will be dead (25 black, 9 white), 1,800 will have been arrested (mostly black) and property damage will be in the millions (all green). 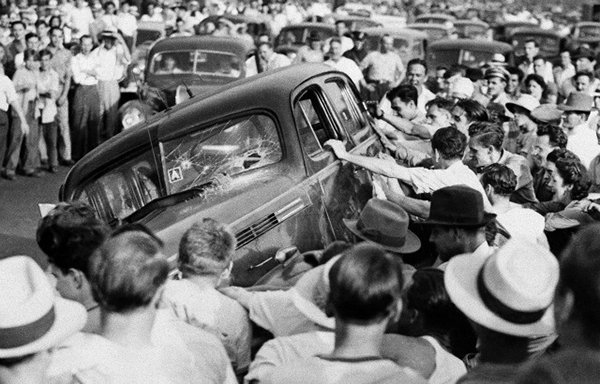 The Battle of Belle Isle is perhaps the greatest single instance of a false rumor inciting a full-scale race riot. An unidentified black man, after fighting with white youths at Detroit's Belle Isle park, is said to have made his way to a nightclub popular with African-Americans, and taken the stage, claiming to be a police officer. He then told the crowd that white youths had thrown a black mother and baby off a bridge. The outbreak of war had seen an influx of 350,000 people to Detroit to work in the many factories there that had been retooled for full scale wartime production. They came from all over, but mostly from the south. 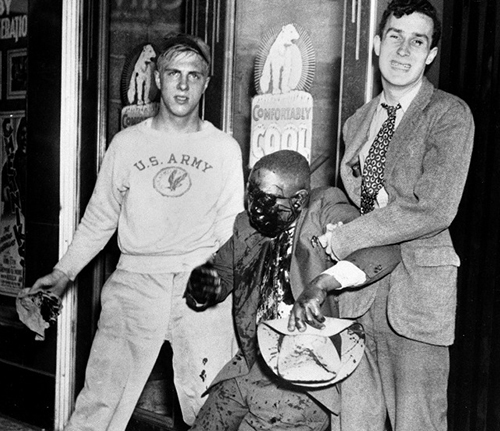 Along with their desire to work, they brought along any and all baggage of bigotry they could carry, not that Detroit didn't already have an ample supply of racial strife. That, added to a critical shortage of housing, grocery stores, child care and public transportation, fostered a tense atmosphere looking for any excuse to set off a powderkeg. Some 5,000 National Guard troops were called in to restore peace, arriving in armored cars and jeeps. Their presence alone cooled the majority of heads, but small skirmishes continued to pop up here and there. Atlantic: The British announce a five-day U-boat attack on the Atlantic convoys and claim that 97% of their ships have survived. ETO - UK: The RAF institutes shuttle bombing missions, with planes leaving England, bombing Germany, reloading in North Africa and then bombing Italy while returning to England. Today's mission begins with the bombers attacking the radar works at Friedrichshafen, Germany. ETO - Netherlands: 5,550 Dutch Jews in Amsterdam are rounded up for deportation to the east. Russian Front - North: Day 651 of 872 of the Siege of Leningrad. Russian Front - North: Day 412 of 658 of the Siege of the Kholm Pocket. MTO - Italy: US 12th Air Force RAF Wellingtons night bomb at Messina, Sicily. During the morning, B-26s bomb the airfields at Milo, Castelvetrano and Bo Rizzo, Sicily. CBI - China: Day 2,175 of 2,987 of the 2nd Sino-Japanese War. PTO: Day 25 of 47 adrift in a raft for the survivors of B-24 GREEN HORNET that crashed 850 miles from Hawaii. PTO - Alaska: Day 379 of 435 of the Battle of Kiska, Aleutian Islands. PTO - New Guinea: Day 60 of 148 of the 2nd Battle of Lae-Salamaua. US 5th and 13th Air Forces provide air support. PTO - Solomon Islands: Allied fighters attack the Vila Airfield on Kolokombara Island. PTO - Solomon Islands: Day 1 of 67 of the Battle of New Georgia. US troops begin landing. ETO: US 8th Air Force: The "Hard Luck" 492nd Bomb Group flies the second of their three deadliest missions, this one to bomb the oil facilities at Politz, Poland. ETO - UK: Day 8 of 86 of the V-1 "Buzz Bomb" offensive on Britain. ETO - France: Day 15 of 49 of Operation OVERLORD, the Allied invasion of Normandy, France, known forever simply as D-Day. ETO - France: Day 15 of 62 of the Battle of Caen. ETO - France: Day 15 of 25 of the Battle of Cherbourg. US troops attack the outer defenses of Cherbourg. ETO - France: US 8th and 9th Air Forces bomb V-1 rocket bases. Germany: Jakob Edelstein, the former senior Jewish elder of the Theresienstadt Concentration Camp, and his family are shot in Auschwitz Concentration Camp. Germany: The underground Directorate of Civil Defense in Warsaw, Poland, sends a radio message to London saying, "Since May 15, mass murders have been carried out in Auschwitz. Jews are taken first, then Soviet prisoners of war, and the so-called sick. Mass transports of Hungarian Jews arrive. Thirteen trains per day, 40-50 cars each. Victims convinced [that] they will be exchanged for [German] POWs or resettled in the East. Corpses are burned in crematoria and out in the open. Over 100,000 people from Hungary have been gassed to date." Russian Front - Finland: Day 11 of 11 of the Battle of Vyborg. Soviet troops capture Viipuri (Vyborg), which was Finland's second largest city. Russian Front - North: Day 140 of 191 of the Battle of the Narva Isthmus, Estonia. Both German and Soviet troops remain locked in their defensive positions. MTO - Italy: Day 16 of 16 of the Battle of the Trasimene Line (north of Rome). Allied Air Forces provide air support. The British 8th Army captures Perugia. The Germans begin to fall back to the Gothic line. MTO - Italy: Day 5 of 34 of the Battle of Ancona. CBI - Burma: Day 108 of 166 of the UK's Operation THURSDAY. Monsoon season bogs down all operations. CBI - Burma: Day 103 of 147 of the Battle of Myitkyina. US 10th Air Force provides air support. Monsoon season bogs down all operations. CBI - Burma: Day 81 of 302 of the Chinese Salween Offensive. US 14th Air Force provides air support. Monsoon season bogs down all operations. CBI - China: Day 2,541 of 2,987 of the 2nd Sino-Japanese War. Day 65 of 259 of Japan's Operation ICHI-GO. CBI - India: Day 105 of 118 of the Battle of Imphal-Kohima. Japanese troops capture Forest Hill, but fail to capture nearby Plum Hill. The Japanese near Kohioma begin retreating toward Burma. PTO - Caroline Islands: US 7th Air Force bombs targets on Ponape Island and in the Truk Atoll. PTO - Mariana Islands: Day 2 of 2 of the Naval Battle of the Philippine Sea aka the Great Marianas Turkey Shoot. Being soundly defeated, the Japanese FLeet withdraws from this area. PTO - Mariana Islands: Day 6 of 25 of the Battle of Saipan. PTO - New Guinea: Day 25 of 83 of the Battle of Biak. 5th Air Force provides air support. PTO - New Guinea: Day 189 of 597 of the Battle of New Britain. US 13th Air Force provides air support. PTO - New Guinea: Day 60 of 481 of the Battle of Western New Guinea. 5th Air Force provides air support. PTO - New Guinea: Day 7 of 80 of the Battle of Lone Tree Hill. PTO - Solomon Islands: Day 233 of 295 of the Battle of the Bougainville Islands. US 13th Air Force provides air support. CBI - China: Day 2,906 of 2,987 of the 2nd Sino-Japanese War. Day 81 of 91 of the Battle of Zhijiang. US 14th Air Force provides air support. Japanese troops continue pulling out of China. PTO - Borneo: Day 11 of 67 of the Battle of North Borneo. Australians troops land at Lutong on Sarawak and gain 25 miles toward the Seria oilfields. US 5th and 13th Air Forces provide air support. PTO - Dutch East Indies: Day 51 of 52 of the Battle of Tarakan Island. PTO - Japan: Day 81 of 83 of the Battle of Okinawa. The mop-up by the US Army continues. PTO - New Guinea: Day 541 of 597 of the Battle of New Britain. US 10th Air Force provides air support. PTO - New Guinea: Day 425 of 481 of the Battle of Western New Guinea. US 10th Air Force provides air support. PTO - Philippines: Day 243 of 299 of the 2nd Battle of the Philippines, aka the Liberation of the Philippines or the Philippines Campaign. PTO - Philippines: Day 188 of 244 of the Battle of Luzon. 5th Air Force provides air support. PTO - Philippines: Day 103 of 159 of the Battle of Mindanao Island. 5th Air Force provides air support. PTO - Philippines: Day 95 of 135 of the Battle of the Visayas region. US 5th and 7th Air Forces provide air support. A rare historical treasure that tells the riveting story of a Dutch family's survival in World War II. As bombs exploded around her house, 14-year-old Johanna was encouraged by her father to document their large family's struggles to survive as they desperately searched for food; fearfully hid Jewish friends; and bravely endured SS brutality, Gestapo searches, and resistance activities.